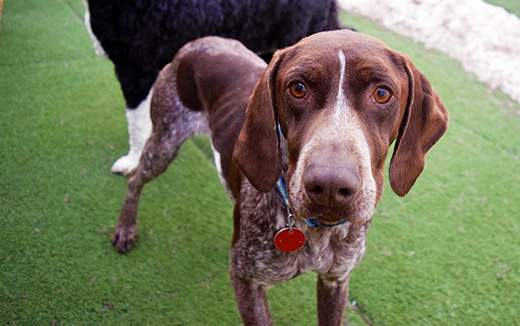 At Camp Bow Wow South Salt Lake, we believe every dog should have a loving fur-ever home. We work closely with local shelters and rescues to help with their adoption efforts, and often have foster dogs staying at Camp. These dogs get to play all day with other Campers, snooze the night away in individual Cabins, and get lots of love and attention from our Certified Camp Counselors®. Personality: I'm Arlen! My brother Adyn and I were surrendered to the shelter by our owner because when he'd take us out hunting we'd run off. Obviously he had no idea how to train a huntin' dawg! My approximate birthday is 1/11/2017. I'm 22.5" at my withers and 45 lbs. I'm a small, solid little guy. I'm active and extremely loving with my people. I'm good with other dogs. I haven't been cat tested, but my rescue lady isn't holding out a lot of hope for that. I need more socialization in lots of environments to become the good canine citizen I should be. That was neglected in my former life when I spent a lot of time on a concrete pad. I'm having a good time in daycare. I can be a little feisty but the people there know all about my breed and how to work with me. I'm looking forward to a breed-knowledgeable home that can love me and give me all the help and training I missed out on during my first two years of life. I'll repay it with hugs and snuggles! Personality: I'm Eddie Van Poodle! That's what my foster mom calls me. My rescue lady called me Kibo when I arrived (it means "hope" in Japanese) but we like Eddie VP much better. The shelter called my rescue lady to say they had a German Wirehaired Pointer mix for her and a friend went to get me for her. She was a little surprised when she saw me! Turns out I'm probably a purebred medium-size apricot poodle. I need some TLC, so here I am with the pointer pack getting my confidence back, learning to go in and out with the other dogs, and trying to understand that no one's going to hit me ever again. I need a patient, secure home with at least a couple of other dogs to give me confidence. I'm about 8 years old, so I have a lot of years to overcome and learn to trust again. Cats are fine - I just ignore them. Kids are way too stressful for me. You can see my coat evolution over 2.5 months in the first composite photo. I was groomed shortly before I was turned into the shelter (twice). 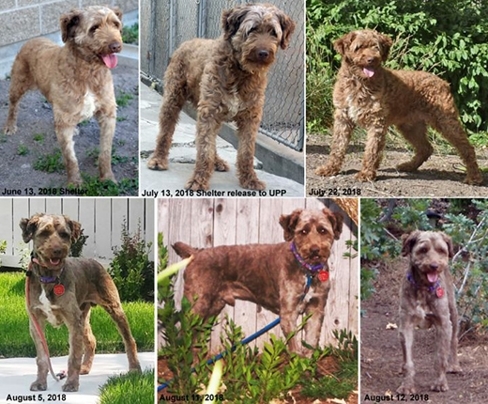 By the time I got to Utah's Perfect Pointers my coat had grown out considerably and was long and soft and curly (and matted). My foster mom took me to her groomer who did a great job on me. My coat grows out every 6 weeks or so, so I'll need a home that can keep me groomed or find a good, gentle groomer to work with me. My approximate birthdate is 7/13/2010. I'm 18" tall at my withers and 33 lbs. The perfect size! If you are interested in adopting or fostering Eddie, please contact Marylin at Utah's Perfect Pointers. Adoption Information: Please email: utahsperfectpointers@yahoo.com if you think you have the perfect home for me. 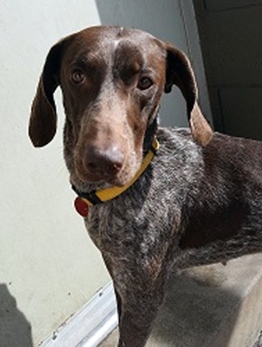 Personality: I'm a gorgeous German Shorthaired Pointer girl with a natural tail and a whole lot of love to give! My approximate birth date is 7/24/2014. I'm 42 lbs and 23" tall at my withers. I was surrendered to Utah's Perfect Pointers by my original owner who just didn't realize how much work I was, and she didn't know how to handle me. I also wasn't particularly well socialized with other people or other dogs while I was a puppy. It took a little while for my new foster mom to get me used to new people and surroundings and it's something that still requires a little work. But with patience and effort from my trainers, I'm finally getting the hang of it! I really like interacting with other dogs - they give me confidence. Once I get to know my people I just love them! I need a lot more socialization with lots of new people by my new family to make me a totally perfect little pointer girl.